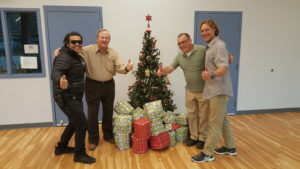 Photo(LtoR):LA County Probation Officer Jose de la Torre, Malibu Optimist Mark Ball, Malibu Optimist President Tarek Shraibati, and LA County Probation Officer Bruce Bates give a thumbs up to the Optimist Christmas surprise. In 2010, we began an Essay & Poetry Contest at Camp Miller. We continue to offer this program at Camp Kilpatrick,one of three LA County Probation Camps in the Santa Monica Mountains. Camp residents are asked to write either an essay (300-500 words) or a poem (200 words) on a topic based upon our Optimist Creed. Their work is independently judged. Participants receive gift cards. We hold one of our regular breakfast meetings at the Camp to honor the participants and to give them the opportunity to share their writing with their peers and our club members.